The Trump administration is facing bipartisan pushback as it proceeds with cuts to the federal prison system, despite Congress recently awarding the agency that oversees the system a funding boost and instructing it to increase hiring. The Bureau of Prisons is facing increasing pressure from Capitol Hill as it seeks to eliminate thousands of positions, with lawmakers ramping up pressure on the agency to follow its instructions by adding to its workforce. The federal prisons overseers have so far not backed down from the scheduled elimination of around 6,000 vacant positions, as well as additional vacancies that have arisen during an extended hiring freeze at the agency. The bureau has increasingly depended on a process known as “augmentation,” in which non-correction officers are reassigned from their normal work into guard duties. The fiscal 2018 omnibus President Trump signed into law last month provided a $106 million increase to the Bureau of Prisons budget. A Senate report on the omnibus directed the bureau to “curtail its over-reliance on augmentation and instead hire additional full-time correctional staff before continuing to augment existing staff.” Sen. Joe Manchin, D-W.Va., recently wrote a letter to bureau Director Mark Inch requesting “detailed information about BOP’s plan to use additional money” in order to “fulfill the explicit congressional mandate” to reduce augmentation. 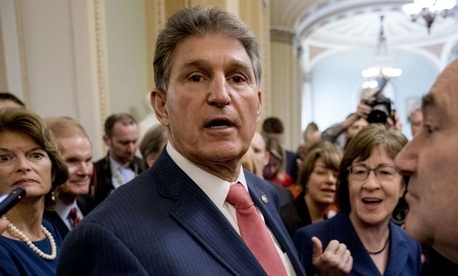 Manchin said he had heard from Inch in response to a previous letter, but the senator remained concerned about Inch’s “assumption that the FY2018 [appropriations measure] would call for the elimination of additional positions within BOP.” Multiple sources confirmed to Government Executive that the bureau is moving forward with its staffing cuts. Inch has met with lawmakers in both chambers to explain his positions, but has yet to reach a resolution with his legislative overseers. Rep. David McKinley, R-W.Va., also met Inch earlier this month and issued a statement saying the agency’s staffing levels were inadequate and creating “dangerous conditions for our corrections officers and our communities.” He previously penned a letter with dozens of bipartisan cosigners imploring the Justice Department not to move forward with the cuts. The bureau has faced a hiring freeze for virtually the entire Trump administration, which followed cuts already in place. In addition to the elimination of positions that Congress authorized but BOP never filled, multiple sources said, the agency is eliminating positions that have remained vacant during the freeze. As the correctional officer-to-inmate ratio has dropped, employees have become “very, very scared to come to work,” Young said. Inmates are smuggling more and more contraband into federal prisons, he said, and medical personnel and administrative staff are increasingly being used as correctional officers. This leaves facilities more vulnerable in emergency situations, as they have fewer additional staff to call upon in an elevated situation. “The more they cut, the higher up the category of the storm that could eventually hit our facilities,” Young said. The federal inmate population has dropped by about 36,000 since 2013, according to bureau statistics, a 16 percent reduction. That trend could soon reverse, however, as Attorney General Jeff Sessions last year directed U.S. attorneys to once again seek mandatory-minimum sentences in virtually all cases. The inmate population decline followed a 30-year increase and was precipitated by Obama-era guidance to seek less stringent sentencing for lower-level crimes. Sessions’ 2017 memo rescinded that guidance. All bureau staff are trained law enforcement officers, the agency added, even those not serving in correctional officer positions. Still, BOP noted reassigning employees could have a negative impact for programs aimed at providing activities for inmates. “We understand concerns regarding augmenting staff, particularly as it impacts our ability to provide programs and services to our inmate population,” the agency said. The Justice Department may be forcing the cuts in an effort to shift more resources to private facilities. In February 2017, Sessions issued guidance that reversed an Obama administration policy to phase out the use of private prisons. Government Executive reported in January of this year that the assistant director of the bureau's Correctional Programs Division, Frank Lara, issued a memo titled “Increasing Population Levels in Private Contract Facilities,” which tasked facility leaders with identifying inmates to transfer to private contract prisons. Young is planning to fight the cuts, engaging not just Capitol Hill, but asking local governments for support. In some cities, he noted, the federal prison is the primary employer.